It is eight years since the release of Queen's previous video hits collection, Box of Flix, and also eight years since Freddie Mercury's death, yet as this new - and inevitably final collection proves, Queen's capacity to produce hits has never diminished. 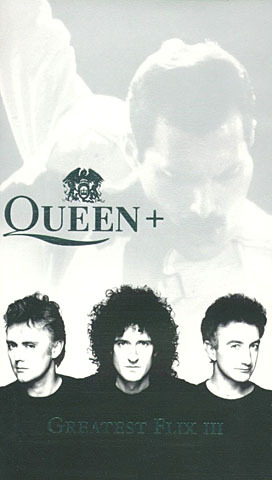 All, with the exception of the new The Show Must Go On have continued Queen's unbroken run on the chart, four reaching No.1. Flix III highlights the massive musical and songwriting strength of John Deacon, Brian May, Freddie Mercury and Roger Taylor, all-powerful as Queen and individually hit makers in their own right. Freddie striking a solo pose with The Great Pretender, and Living on My Own, and with Montserrat Caballé on Barcelona; Brian forging a massively successful solo career with Driven By You. Roger Taylor provided the band with one of its biggest songs with Heaven For Everyone, originally tailored for his The Cross solo project. Also brought together on Flix III are Queen's great collaborations - Queen + David Bowie on Under Pressure here featured in a new 'Rah!' version with additional recording work from Brian and Roger, Queen + George Michael with the number that dominated the 1992 Freddie Mercury Tribute Concert, Somebody To Love, plus a majestic never previously heard version of The Show Must Go On by Queen and Elton John, recorded in Paris in 1997 as the closing to a new ballet which paid tribute to Freddie and the many others who have died before their time. While the songs contained here will be familiar to millions, many of the videos are being seen for the first time - director Russell Mulcahy's epic Princes of The Universe inspired by his film Highlander for which Queen provided the music score; an awesome and brand new Under Pressure specifically produced using unique footage of Freddie and David Bowie, and The Show Must Go On, Queen and Elton John live with the legendary Béjart Ballet. Of course the classic performances are also here - Freddie and Montserrat's larger-than-life Barcelona, Queen's rare live Top of the Pops appearance for Las Palabras De Amor, and the forever haunting These Are The Days Of Our Lives. Queen, we still love you too.